Legions of scientists have studied and taken images of the Crab Nebula — in fact, it’s one of the most-studied object in space. But until now, astronomers have never been able to glimpse the object at the heart of the massive gas cloud. Until now. New Hubble images have revealed a fast-moving neutron star at the heart of the nebula. The Crab Nebula, which lies 6500 light years away from Earth, was created by a supernova long ago. A massive star in the Taurus constellation exploded at immense speeds, creating the expanding cloud of gas we see today, called a supernova remnant. Most images of the nebula focus on the intense colors and shapes of the nebula’s outer filaments, but what’s going on in the heart of the cloud may be even more interesting. It turns out that when the original star making up the nebula exploded, it left behind its inner core, a strange and exotic object known as a neutron star. While this star has roughly the same mass as our sun, it only measures a few tens of kilometers across — an incredible density made possible by the compression of the subatomic particles that make up the star. Until now, it’s been almost impossible to capture this star’s movement on camera due to its high speed: it rotates approximately 30 times per second. To capture the neutron star, astronomers used the Hubble Space Telescope to take three high-resolution images about 10 years apart each. Those images were combined together to create a sort of time-lapse showing bright “ripples” in the center of the nebula; bands of light are actually caused by the radiation of electrons spiraling through the star’s magnetic field at nearly the speed of light. 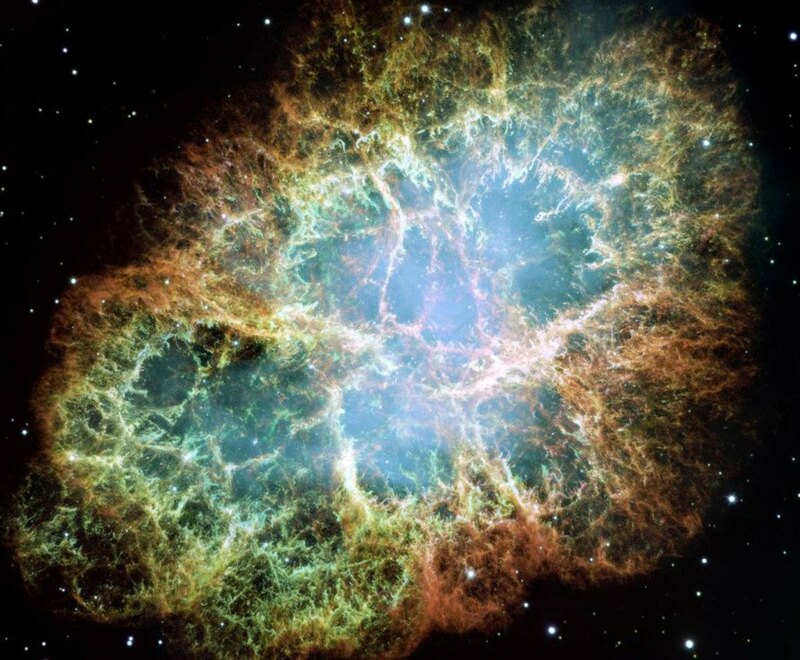 This isn’t the first time the Crab Nebula has made history. The supernova explosion that created the cloud was one of the first such events in recorded human history. In the year 1045, astronomers in Japan and China noticed a bright new star in the night sky said to be nearly as bright as the moon. That bright light was caused by the distant explosion, and over the next several years it gradually faded until it was invisible to the naked eye. Luckily, it’s still possible to see with the help of the Hubble. Legions of scientists have studied and taken images of the Crab Nebula -- in fact, it's one of the most-studied object in space. But until now, astronomers have never been able to glimpse the object at the heart of the massive gas cloud. New Hubble images have revealed a fast-moving neutron star at the heart of the nebula. The Crab Nebula, which lies 6500 light years away from Earth, was created by a supernova long ago. A massive star in the Taurus constellation exploded at immense speeds, creating the expanding cloud of gas we see today, called a supernova remnant. Most images of the nebula focus on the intense colors and shapes of the nebula's outer filaments, but what's going on in the heart of the cloud may be even more interesting.